One of the reasons I decided to revitalize this blog was that I missed having an outlet to vent some of my random half-formed theories and gut instincts about the future of new media. I’d been (mostly unbeknown to me) forumalting the seeds of a grand theory about how media audiences are segmenting, how content creation with niche audiences in mind is increasingly important, how audiences will get smaller but choosier… lots of good stuff. So… go read that instead. 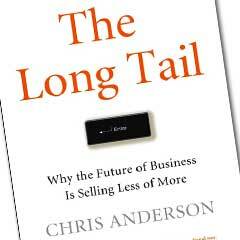 One of the interesting things of the concept of â€œthe long tailâ€ is that it’s a relatively easy concept for the novice to grasp. To whit: when a consumer isn’t limited by scarcity they are more diverse in their consumption choices. This just makes sense. At a corner store I’ll be happy to find â€œcheeseâ€, at a large grocery story I’ll pick up â€œfat free mozzarellaâ€, and at a specialty shop I might eventually get â€œreduced fat Canadian bocconcini.â€ With an increase in selection, I can narrow down much tighter what actually appeals to my taste. Why Anderson’s book does an admirable job of showing how these â€œnon-blockbusterâ€ markets are increasingly important to on-line ventures that are not limited by conventional shelf-space (like Amazon, or iTunes) it doesn’t take into account the implication that this is a natural consequence of social interaction as well, and has implications for social networking, viral marketing, and all that other marketing gak that advertisers are, increasingly, excited about. There is no question that the Long Tail was one of those “Why didn’t I think of that – wait… no actually I sort of did” books. Anyone who is at all interested in the theory and practice of media and communications had some kind of feeling that this was happening. They just didn’t have the research or the pithiness to make it work. That isn’t to say that the book isn’t amazing, it is, and definitely worth a read. It is just that the central concept is pretty much intuitive, but the implications are sweeping and complicated. To me this book ranks up there with Jared Diamond’s Germs, Guns and Steel for making the world seem a little bit more understandable.